Carry the .43 inch convertible laptop wherever you go. At just 2.6 pounds, you will hardly even notice the weight. Covered from head to toe in Corning® Gorilla® Glass, the Spin 7 sports a 14” narrow bezel screen on a 13” chassis. 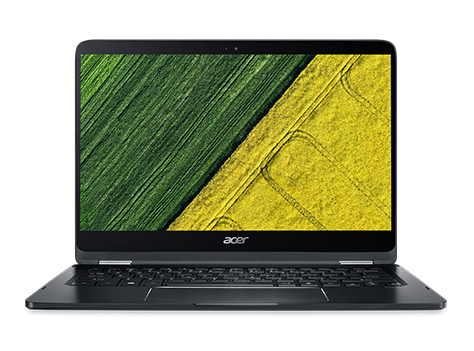 Acer’s 360° convert hinge maintains a slim, durable look while providing 4 modes for you to enjoy. 2. Battery life varies depending on model, power settings and usage. 3. Windows Hello requires specialized hardware, including fingerprint reader, illuminated IR sensor or other biometric sensors and capable devices. 4. Limited to compatible websites and apps. 5. Cortana available in select markets; experience may vary by region and device.